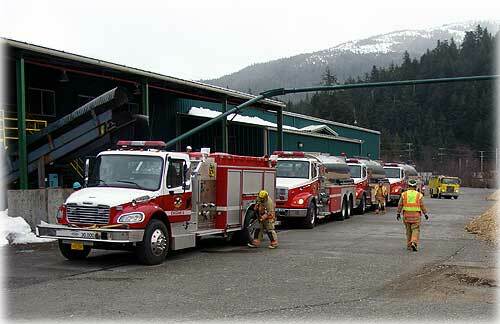 Fire tankers from North Tongass VFD, Ketchikan Fire Department and South Tongass Volunteer Fire Department lined up ready to start the testing in front of the old veneer plant at Ward Cove. 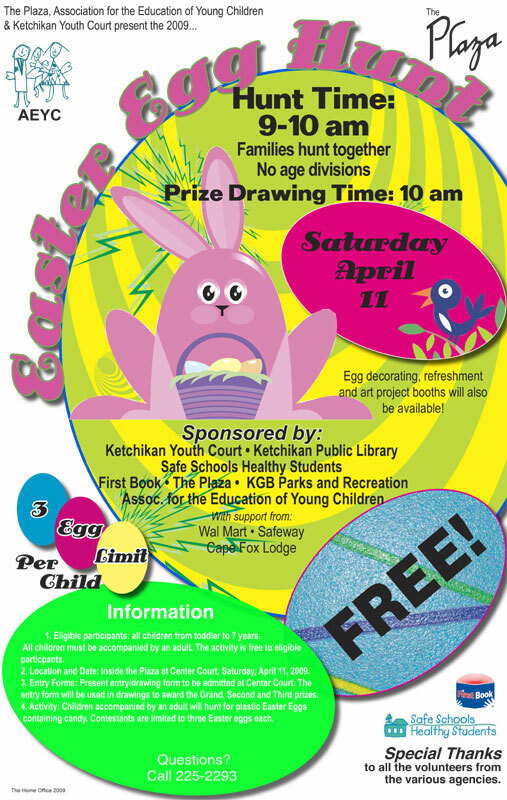 Ketchikan: North Tongass Volunteer Fire Department Evaluated For Fire Service Rating - If you were driving by the old pulp mill site last Saturday morning (April 4th) you might have wondered what was going on. Fire engines and water tankers were lined up waiting for their turn for action. Since its inception in March 2003 by a vote of the North Tongass residents, North Tongass Volunteer Fire Department (NTVFD) has been working toward this day said Fire Chief Dave Hull. "On this day NTVFD was evaluated by the Insurance Services Office (ISO) to see how our firefighting capabilities matched up to their standards and other fire departments in the nation," said Hull. The Insurance Services Office is headquartered in Jersey City, NJ. ISO's Public Protection Classification (PPCTM) Service gauges the capacity of the local fire department to respond if flames engulf a home or commercial property. ISO collects information on a community's public fire protection and analyzes the data using their Fire Suppression Rating Schedule (FSRS). Then they assign a Public Protection Classification from 1 to 10. Class 1 generally represents superior property fire protection, and Class 10 indicates that the area's fire-suppression program doesn't meet ISO's minimum criteria. This classification number is used by many insurance companies to base their insurance rates on. Alaska: Revenue Commissioner Responds to CBR Investment Controversy - Tuesday Department of Revenue Commissioner Pat Galvin responded to press reports regarding investment decisions the department has made regarding the Constitutional Budget Reserve (CBR) Fund. The controversy arises from the desire of the Legislature and the Department of Revenue to see greater investment returns on the portion of the CBR that is not expected to be needed for five years. This more aggressively invested account is called the "CBR sub-account". Last year the legislature included intent language in the budget directing DOR to invest the $2.6 billion of new CBR funds in a manner maximizing long-term earnings. In other words, between the two CBR accounts, the legislature wanted DOR to put the funds into the sub-account. Subsequently, the department went to the legislature seeking an increase in the appropriation from the CBR to cover the fees needed to manage both CBR accounts. In the explanation for the budget amendment, the department disclosed that it intended to transfer a total of $4.1 billion into the sub-account. Alaska: REDOUBTS' LIGHTNING JACKPOT HIT By THOMAS GUENGERICH - New Mexico Tech lightning researchers hit the jackpot last week, when, for the first time ever, they began recording data from a volcanic eruption right from the start. 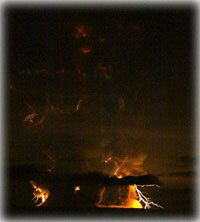 Photo of lightning from Redoubt Volcano during its 11:20 p.m. eruption on March 27, 2009. Largely funded through the National Science Foundation, the New Mexico Tech volcanic lightning studies aim to advance the understanding of electrical activity during an eruption. "What's really exciting is that we got the Lightning Mapping Array set up before the initial eruption," doctoral student Sonja Behnke said. "We're getting data from the beginning of the eruptive phase of the volcano. We're seeing everything from the beginning to the end." When Alaska's Redoubt Volcano started rumbling in January, a team of Tech researchers hurried to south central Alaska to deploy a series of radio sensors. When the volcano began erupting overnight on March 22 and 23, the array of stations started returning clear and dramatic information about the electricity created within volcanic plumes and the resulting lightning. Alaska: DOT&PF reminds motorists to remove studded tires - The Alaska Department of Transportation and Public Facilities (DOT&PF) reminds motorists the studded tire season is about to end, and they should remove their studded tires by the legal deadline. "The use of studded tires is a major factor in the deterioration of our highways, and their use must be strictly enforced to the legal season," said DOT&PF Commissioner Leo von Scheben. Ketchikan: Sourdough Stampede Runners Triumphed - Runners triumphed despite strong winds in Saturday's Sourdough Stampede. Fifty five runners and walkers participated in Ketchikan Running Club's first event of the season. Caleb Hedin was the first miler to cross the finish line in 6:22. Second place went to Mark Felarca in 6:46 followed by Ken Teune 6:48. Rique Hill won the woman's mile in 7:39. Second place woman was Mary Keele in 8:73 and third place was Charley Edwardson in 8:48. The 5K racers faced the wind for their entire event. Dan Patten won with a time of 20:22 followed by Greg Singstad 21:30 and Eric Collins 22:28. Leigh Woodward won the woman's 5K in 26:16 followed by Laura Kinunen at 27:21 and Angela Salazar 29:29. Ketchikan: St. Joseph Hospital Earns Top Awards - St. Joseph Hospital in Bellingham, a partner with Ketchikan General Hospital in the PeaceHealth system, is the only hospital in Washington state to earn both the 2009 Patient Safety Award and the 2009 Patient Experience Award from HealthGrades, the nation's leading independent healthcare ratings organization. St. Joseph is among the top five percent in the nation for patient experience, the only hospital in Washington State to achieve this ranking. St. Joseph Hospital is also ranked in the nation's top five percent for patient safety.